Qosmotec is awarded with the WE DO DIGITAL Award 2018. 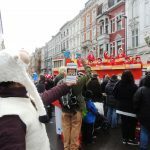 The idea to create an app for the Carnival in Aachen, which shows all events in the Aachen Carnival Season and displays information about the big parade on Carnival Monday to the spectators along the streets convinced the jury of the German chamber of industry and commerce. The price will be hand out on the Cebit in Hannover on June 12th 2018.